The United States called on Russia to end the occupation of Crimea in a declaration issued by the Department of State on July 25. 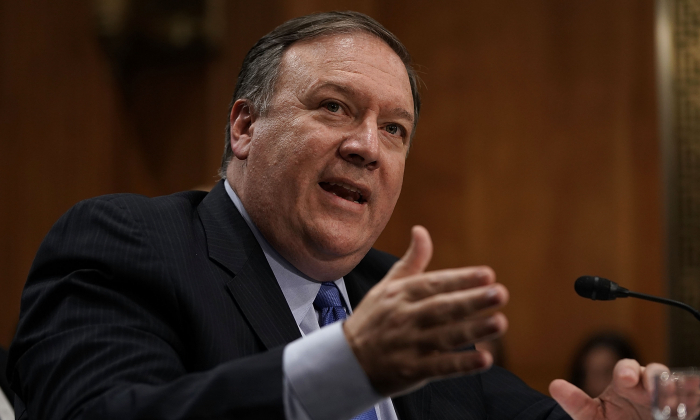 Secretary of State Mike Pompeo told lawmakers shortly after the declaration was made public that the document serves to formalize America’s long-held position concerning Russia’s attempted annexation of the Crimean Peninsula. “The United States calls on Russia to respect the principles to which it has long claimed to adhere and to end its occupation of Crimea,” the declaration states. Sanctions against Russia will remain in place until Russia returns Crimea to Ukraine, Pompeo told lawmakers on the Senate Committee on Foreign Relations. Russia’s Foreign Ministry dismissed Pompeo’s comments. “We know the worth of such momentous declarations,” ministry spokeswoman Maria Zakharova said on her Facebook account. The United States issued the declaration nine days after President Donald Trump’s meeting with Russian President Vladimir Putin in Helsinki. Trump said the relations between the two nations were at a low point before the meeting but have since improved. Trump and Putin discussed Russia’s occupation of Crimea at the summit. Moscow contends that its annexation is legal since it was approved through a popular vote in a referendum. The United States has never recognized the legitimacy of the annexation. Russia invaded Ukraine in 2014 and the war continues to this day. More than 8,000 people have been killed. The complex conflict sprung out of civil unrest following a decision by Ukraine’s pro-Russia president to renege on a promise to sign an agreement with the European Union in favor of closer ties with Russia. Pompeo defended Trump’s stance on Russia in a testimony before lawmakers of the foreign relations committee. The president’s domestic opponents, including Democrats and some Republicans on the committee, have seized on parts of Trump’s comments in Helsinki to allege that he was soft on Russia. In his opening statement, Pompeo confronted the criticism with a battery of actions Trump has taken to confront Russian aggression around the world. The Trump administration has issued 213 sanctions against Russian entities and individuals, expelled 60 Russian spies, closed Russian consulates in San Francisco and Seattle, led or participated in 150 military exercises in Europe, spent $11 billion on the European defense initiative, sent defensive weapons to Ukraine and Georgia, and authorized $200 million in security cooperation funds to Ukraine, Pompeo said. Trump has also criticized Germany for making a gas pipeline deal with Russia that would enable Moscow to cut Ukraine out of a lucrative transit contract. At the Helsinki summit, Putin said Russia is ready to extend Ukraine’s contract pending the resolution of a legal dispute. The information Pompeo listed is public knowledge, but Trump’s opponents have largely eschewed these facts in favor of a media narrative that the president allegedly colluded with Russia. The allegations have been the subject of investigations for nearly two years, yet have not yielded any evidence or indictments related to collusion. Special counsel Robert Mueller, who is investigating the claims of collusion and Russia’s meddling in the 2016 election, indicted 12 Russian intelligence officers on July 13, days before Trump’s meeting with Putin. The indictment alleges that the officers hacked into Democratic computer systems, stole emails and files, and disseminated the loot with the goal of interfering in the presidential election. Putin made an offer to Trump to have Mueller’s team travel to Russia and question the officers in exchange for allowing Russian law enforcement to question American officials they suspect of wrongdoing. Trump declined the offer days after the meeting and expressed hope the officers would appear in court to stand trial. Pompeo reiterated to lawmakers that Trump accepts the assessment that Russia attempted to interfere in the 2016 election. Pompeo said that he personally told his Russian counterparts in Helsinki that there will be consequences if Moscow attempts to meddle again. Russia denies the allegations. Trump’s opponents have attacked him for meeting with Putin and North Korean leader Kim Jong Un, citing Putin’s authoritarian streak and Kim’s human rights record. Trump has said that diplomacy and engagement are preferable to hostility and conflict. Pompeo told lawmakers that it is in everyone’s interest for the United States to not have a contentious relationship with Russia. Trump said last week that he would invite Putin to the White House for a meeting in the fall. According to national security adviser John Bolton, the meeting has been pushed to next year, after Mueller’s probe is over. “The president believes that the next bilateral meeting with President Putin should take place after the Russia witch hunt is over, so we’ve agreed that it will be after the first of the year,” Bolton said in a statement. In the days after the Helsinki summit, Russia publicized tests of its new weapons. Hollywood-style footage from the Russian Defence Ministry showed a Russian MiG-31 fighter jet taking off from an airfield carrying the new Kinjal hypersonic missile and then launching it while airborne. The video also showed the launch of a nuclear-powered missile and a missile with a maneuvering warhead that can allegedly travel around missile defense shields. The United States and Russia hold 90 percent of the world’s nuclear weapons. Trump and Putin have spoken of the need to avoid an arms race, and Putin has spoken of the urgent need to work to extend the new START strategic arms reduction treaty.